We have NO PUPPIES available right now and no upcoming plans. ​ We do not ship puppies, you must come here in person to meet us. All puppies are vet-checked, de-wormed, given their first vaccinations, and microchipped prior to leaving us. Pet/Companion puppies will be sold with a spay/neuter contract, and registered on AKC's Limited Registration. Puppies will not be assessed as to pet or show potential until at least 6-7 weeks of age, and NO puppies will leave us prior to 9- 10 weeks of age, perhaps longer. Time with mom and littermates is critical to proper socialization, they can teach each other things we cannot. Our last litter, singleton puppy Teega, was raised using Puppy Culture protocols, and we will continue to use this wonderful program for puppy raising going forward. Breedings, for us, are not gone into lightly: YEARS of research and thought has gone into the decision, and a breeding is only undertaken when it is the right time for us to add another dog to our own family, and when we feel like we've finally found the right combination of pedigrees to give us the best chance we have of producing the type of dog we are looking for. 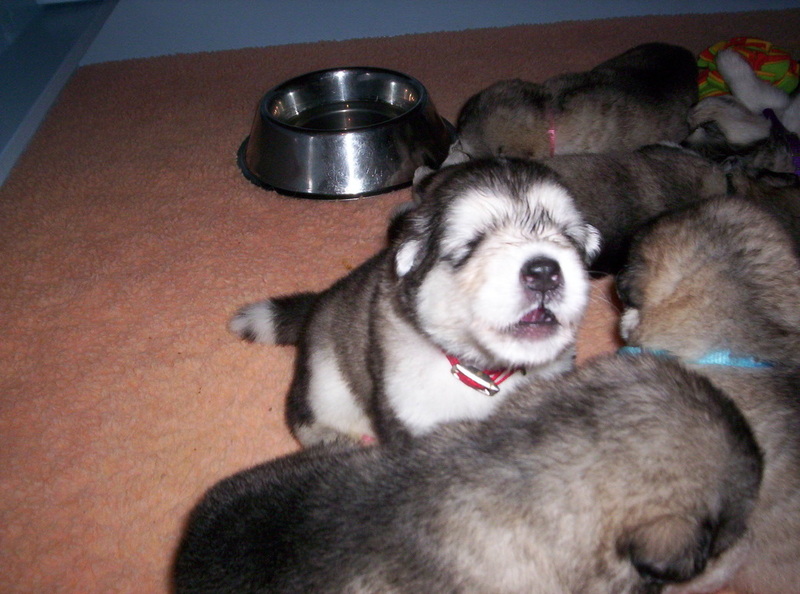 We use only dogs who have been examined clear of hip dysplasia and hereditary eye disease, and who also have been DNA tested for the Alaskan Malamute Polyneuropathy gene (or alternately, are clear by parentage). 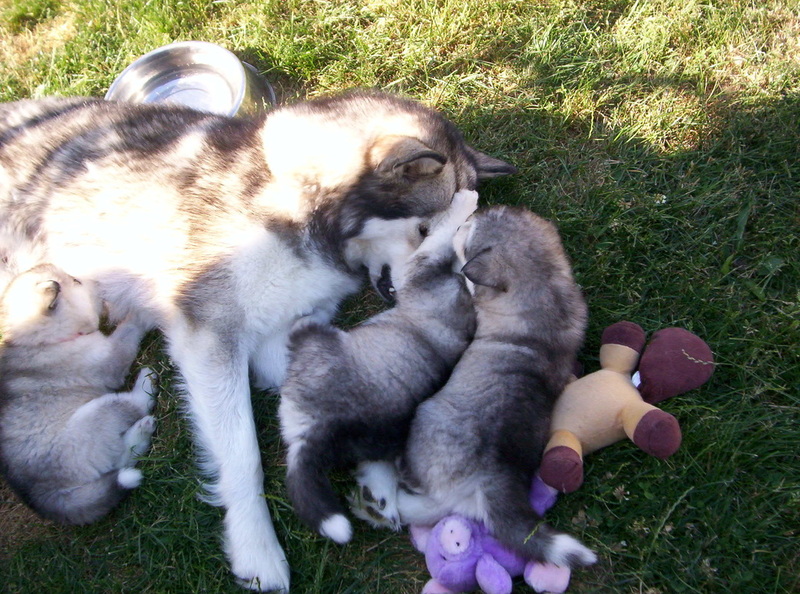 All breeds of dogs, like all species worldwide, carry genes for genetic disease or disorders. It is not always possible to predict the likelihood of heredity, but we are doing what we can through careful pedigree research and full discussion of such with all involved parties before we go ahead with a breeding. All of our adult dogs have DNA banked with OFA/CHIC for use in future health studies, as well as their associated information and that of their parents and siblings kept current with that organization. As always, if you are unsure about a puppy, we encourage you to consider RESCUE! Many wonderful dogs are waiting in foster homes and boarding facilities for the person that will give them the chance to live "the good life". 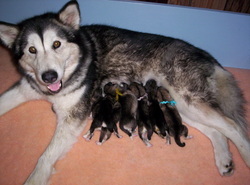 Please visit the Alaskan Malamute Assistance League and the Malamute H.E.L.P. League for more information. They are always also grateful for donations of time and funds.